For women & girls ages 12 and up. Three packs of 10 units. Keep a pack in your purse, car, and at work. On hand & ready to go. 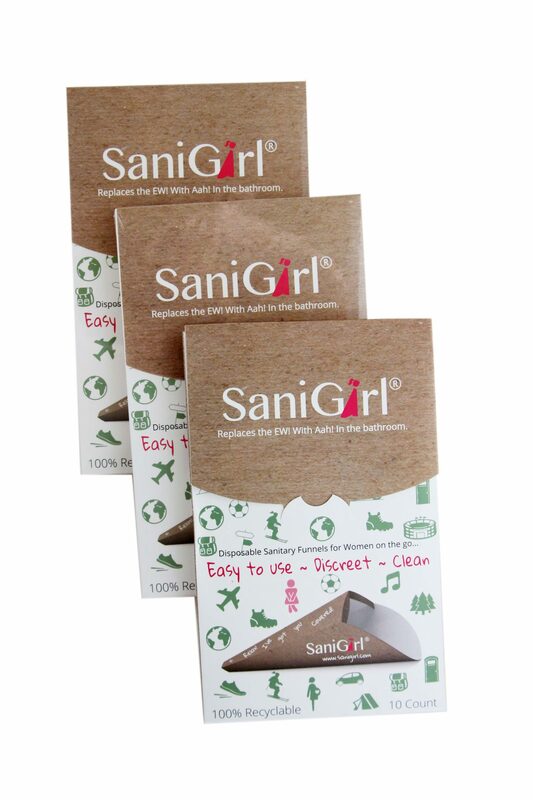 All SaniGirl funnels and packaging are eco-friendly & 100% recyclable. Stylish design, easy to use, works great. Our fresh new design of the same great SaniGirl & Venus products. What is SaniGirl? A new generation of compact & disposable sanitary pee funnels made for life on the go. Purchase the 3 pack bundle (30 units) and save. SaniGirl offers a healthy solution to avoid germs and exposure when nature calls anytime away from home. They are convenient, practical, comfortable, economical, and easy to use. Carrying SaniGirl in your bag, pocket, and car gives the peace of mind to go everywhere you want to go and never worry about the bathroom again! SaniGirl is a BFF bathroom accessory to have with you away from home to cleanly & safely avoid germs, squatting, backsplash, contaminated surfaces, and all other unwanted exposure! SaniGirl for everywhere but home. Public Restrooms – Portapotties – Outdoor Recreation – Travel & beyond..
Go places. Have fun. Adventures await! Your life on the go will be better with SaniGirl. SaniGirl® is made of top-grade reinforced industrial composite paper which is coated inside and out with a leak-proof barrier to ensure a secure and waterproof construction. Product contains 10 funnels per sleek reclosable 10 pack. Each funnel is approx. 7 1/4”H x 4 3/8”w (17cm L x 11w) and is the thickness of a card.. Try it now! We are not kidding! Although it is easy to use, we definitely recommend you try it at home right away. Take one and use it a few times in your own bathroom. This will get you comfortable & in the habit fast! The secret to success is really just knowing that you have to create a seal and cover the area. Don’t squat – You stand. YES! It is going to be a different sensation – for sure! It doesn’t seem possible that it will work standing. Trust that it does! Woohoo! AWESOME!! Now take us with you everywhere!